Sales manager, Steve Baker giving out the first annual Special Needs Driver of the year Award to Tammy Cummings. The second annual “Special-Needs School Bus Driver of the Year” award opened Jan. 1, as AMF-Bruns is seeking bus drivers who have distinguished themselves in the line of duty. AMF-Bruns said it is seeking someone who has performed special accomplishments, meritorious and heroic acts, or innovations, to improve their job. Applications will be accepted until Aug. 1. The winner will receive a check for $1,000. Due to the many applications the company received last year—between 400 and 500— the company said it is considering choosing two 2019 winners, one for Canada and one for the U.S.
AMF-Bruns announced the 2018 winner in November. 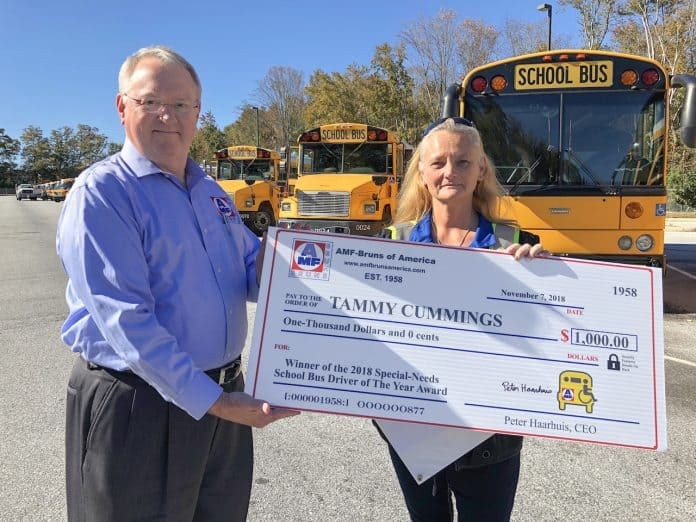 Tammy Cummings, a special needs bus driver for the Greenville County School System in South Carolina, was honored in a special ceremony at her school district. Cummings was selected based on her ability to lessen the crash forces for her students during a collision. In that incident, a tractor-trailer crossed the center line, spun out of control and hit her bus nearly head-on. She kept the children calm and inside the bus, as first responders dealt with downed power lines. AMF-Bruns is a family-owned company based in Germany. The company focuses on wheelchair tie downs, restraints, head and back rests, ramps and flooring systems.